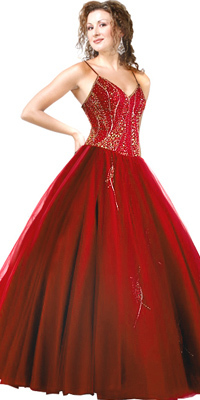 This ball gown looks hot with really thin spaghetti straps and a deep-plunging neckline. The bodice is embroidered and heavily beaded. The skirt if full and round that looks way too puffy. It also has designs at random places that make this whole dress a perfect wear to a ball.